Special Assistant to the President for Press and Public Relations Amos Chanda has disclosed that Police are investigating a political leader who is believed to have incited people to riot. 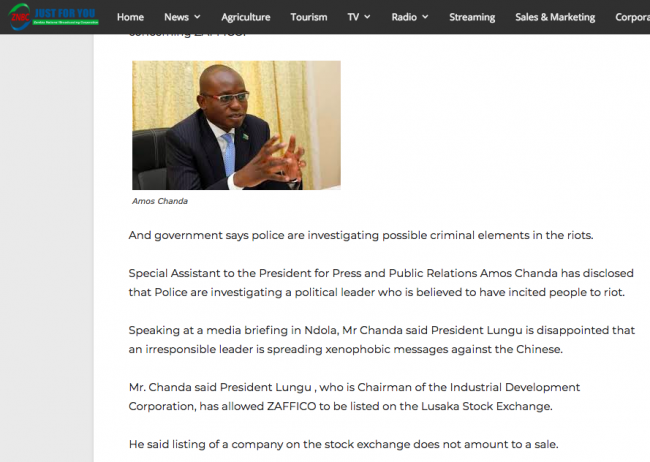 Speaking at a media briefing in Ndola, Mr Chanda said President Lungu is disappointed that an irresponsible leader is spreading xenophobic messages against the Chinese. Mr. Chanda said President Lungu , who is Chairman of the Industrial Development Corporation, has allowed ZAFFICO to be listed on the Lusaka Stock Exchange. He said listing of a company on the stock exchange does not amount to a sale.